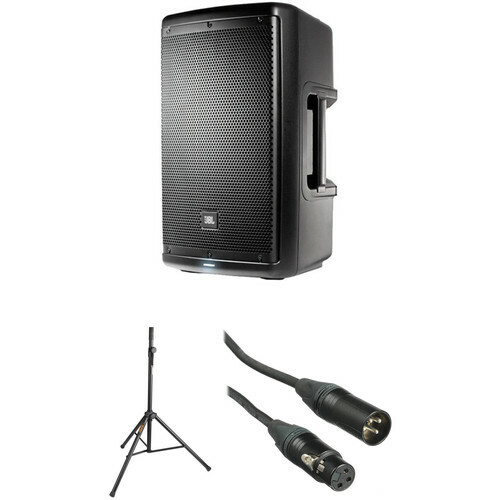 Speaker Type | Driver Size: 2-Way | 10"
2-Way | 10" 2-Way | 12"
2-Way | 15" Subwoofer | 18"
This B&H Kit consists of a JBL EON610 - 10" Two-Way Multipurpose Self-Powered Sound Reinforcement Speaker, a steel speaker stand for supporting the speaker, and a Kopul premium XLR-3M to XLR-3F cable for connecting the speaker to your mixer or other compatible audio device. The system is suitable for live sound reinforcement applications such as public address and playing music in situations where a mono source is sufficient. The JBL EON610 is a two-way 1000W peak Class-D amplifier driven live sound reinforcement speaker that combines a wave-guided high-frequency driver with a 10" woofer in a bass-reflex cabinet. The speaker was designed from the ground up by JBL engineers to leverage the latest advancements in cabinet materials, acoustic science, transducer design, and integrated Bluetooth controllable DSP. The combination of the 300W peak powered wave-guided high-frequency transducer and the 700W peak powered 10" woofer with bass-reflex ports delivers a frequency range of 52 Hz to 20 kHz at -10 dB and a frequency response of 60 Hz to 20 kHz at +3 dB over a 110 x 60° coverage pattern with a Max SPL output of 124 dB for a wide range of applications. The coverage pattern of the Image Control Waveguide is designed to match the high frequencies, crossover point, and low frequencies to deliver a more consistent on-axis and off-axis response. This allows the speaker to sound the same to members of the audience throughout the coverage pattern. Inputs are provided on dual combination mic or line XLR-1/4" input connectors with individual signal gain knobs and a master volume knob for the overall level. An XLR loop-thru allows you to route the signal to additional EON600 series speakers. To enable fine tuning of the speaker in different acoustic environments, the speaker includes a built-in DSP processor with Bluetooth v.4 control through an iOS or Android app. The app provides wireless control over the speaker's 5-band parametric EQ, saving and recalling presets, and adjusting the master volume. A push button on the back of the speaker allows you to physically switch between four different modes: Main, Monitor, Speech, and Sub for when incorporating a dedicated subwoofer. Additional controls include a button for engaging the built-in EQ, disabling the speaker's front LED indicator light, and configuring Bluetooth control. The speaker is designed to work in a variety of configurations including on its side as a floor monitor, vertically as a floor monitor, suspended from above, placed on a tripod stand, placed on a pole mount on top of a subwoofer, or stacked on top of one another using their molded index feet. This single Musicians Value C3 Series CS-SS3 Steel Speaker Stand is well suited for light-duty work in bars, clubs, hotels, houses of worship, and other venues where small PA systems are typically used. The stand fits speakers with standard 35mm sockets. Its height is adjustable from 50 to 75" and a metal pin keeps the shaft safely in place during use. The CS-SS3's steel construction and 54" tripod base provide a robust and stable support for your speaker. The stand easily folds for convenient transport and storage. The black Kopul Premium Performance 3000 Series XLR M to XLR F Microphone Cable (20') is designed to be an extremely quiet and flexible cable that is ideal for the most demanding live sound and performance applications. The cable is engineered to be durable and to provide protection against EMI, RFI, and static noise. While the cable's color-coding affords the ability to quickly differentiate between multiple connections on stage, it provides a pleasant aesthetic quality at the same time. Audio I/O 2 x Combo XLR / 1/4"
Box Dimensions (LxWxH) 25.0 x 15.0 x 13.0"
Box Dimensions (LxWxH) 40.0 x 5.0 x 5.0"
Box Dimensions (LxWxH) 8.6 x 7.0 x 0.4"